In Rethinking Information Systems in Organizations John Paul Kawalek challenges the current orthodoxy of information systems and proposes new alternatives. Bold and ambitious, this book tackles the thorny issues of integration of disciplines, cross over of functions, and negotiation of epistemological divides in IS. Historically, the IS discipline has struggled to embrace and integrate technical as well as organizational knowledge, skills and methods. Kawalek argues that there are now a new set of imperatives that will irrecoverably change IS, affecting the way many organizations deploy and access their information and technology. This book defines how the traditional practices of Information Systems are required to integrate into a process of organizational problem-solving. 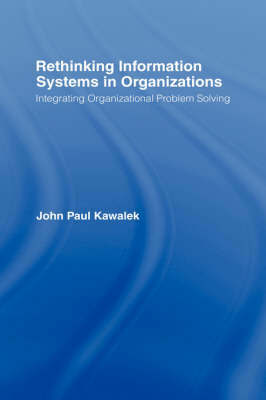 An essential read for students of business information systems, organizational theory and research methods, Kawalek's work also provides core methodological principles on organizational change and problem solving, and presents an effective rationale for their use in Information Systems contexts. "This engaging and challenging discourse represents an important contribution to the debate over useful application of IS theory and practice to organizational problem solving. It highlights the significance of effective application of Systems theory and thinking to successful organizational change and consequently presents a necessary critique of the current discipline of IS. With the ever increasing capability and decreasing costs of computer technology its timing is highly appropriate." "This text is written with admirable intellect and rigor. A valuable contribution to the IS library."